Honor your loved one with a special gift this year. 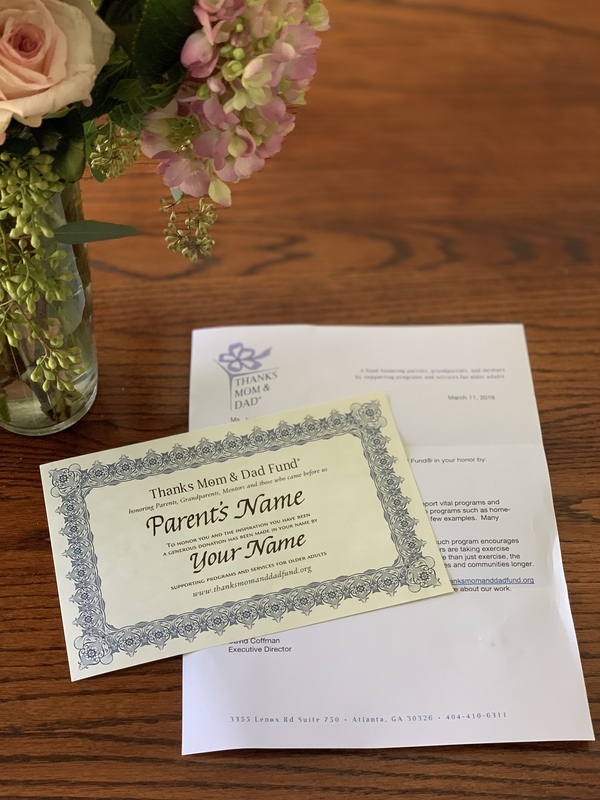 With a donation to Thanks Mom & Dad Fund, you can send a special certificate and custom letter. Your donation will help support programs for older adults and caregivers such as home-delivered meals, transportation services, and caregiving. Your donation will help fill the funding gaps for these services while letting your loved one know how thankful you are for them. Your investment in Thanks Mom & Dad Fund will help support vital programs that help older adults and caregivers. One such program encourages innovation at senior centers. With new programming, more seniors are taking exercise classes and "moving joints that we didn't remember we had." More than just exercise, the classes improve balance and help older adults to live in their homes and communities longer. With your donation your loved one will receive a certificate and a letter letting them know you donated in their honor. When you click the donate button select "yes" at the bottom of the form under "Honor or remember someone with your gift". Enter in requested information. Be sure to check "yes" next to "notify recipient” and include their mailing address! In order for certificates and letters to be received by Mother's Day, Sunday, May 12th, please make your donation no later than May 5th. For donations made after May 5th, certificates and letters will be mailed after May 12th.